Sending contacts from an iPhone is very easy, all data about the contact, from name, phone number, picture, email, URL, etc, can be exported as an inclusive vCard bundle and sent to someone else by email or text message. While we’ll focus on sending contacts between iPhones, these vCards are also usable by other iOS devices, Macs, Windows, Windows Phone, Android, and even Blackberry phones, because the exported VCF format is pretty much universally accepted across all platforms as an address book standard. 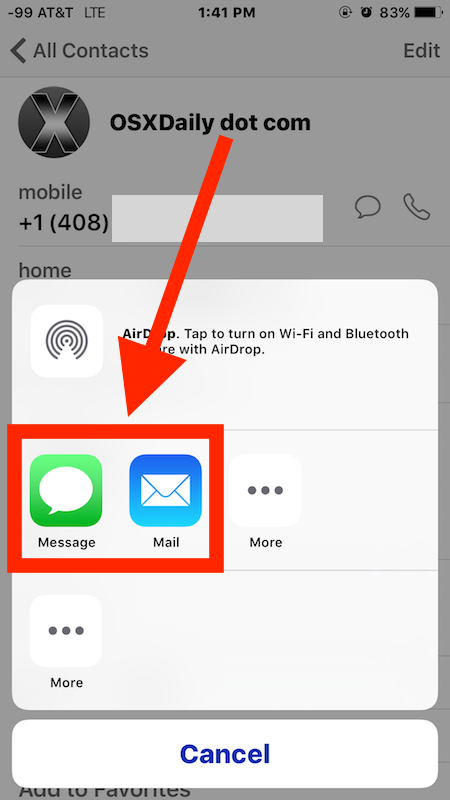 Depending on the choice of sharing method, either the Mail or Messages app will open and contain the selected contact in a preformatted message. 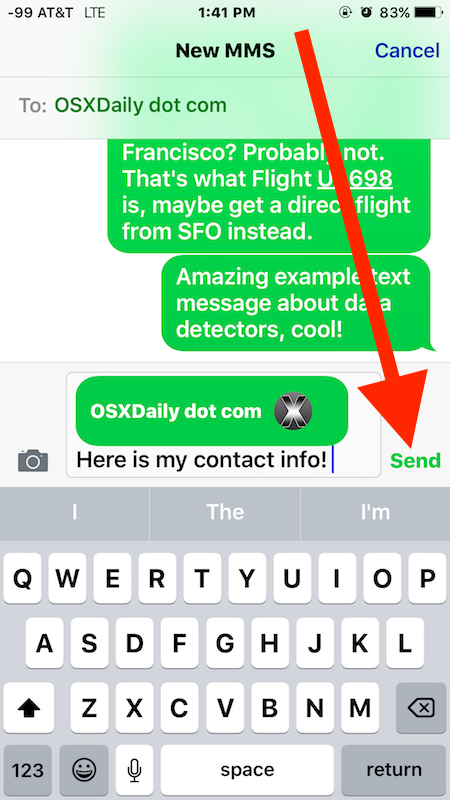 If you choose Messages, the recipient will either need SMS service or iMessages enabled. From here you choose the recipient of the contact as if you were sending a standard email or text message and click send as usual. This works exactly the same on all versions of iOS, it may look slightly different with some versions compared to other, but the feature is the same and the ability to share, send, and receive contact data from iPhone is always there. For some more information, the vCard format is not proprietary to Apple and the iPhone, these documents are widely considered the standard for virtual business cards, and should work on virtually any modern communication device, be it a smartphone, tablet, or PC. Obviously the standardization makes it much easier than manually typing out name, phone numbers, emails, and whatever else, so get in the habit of using the iPhones vCard sharing system and you’ll thank yourself later. For the user on the receiving end, if someone sends you a contact and you want to add it to your phone, it is quite simple. 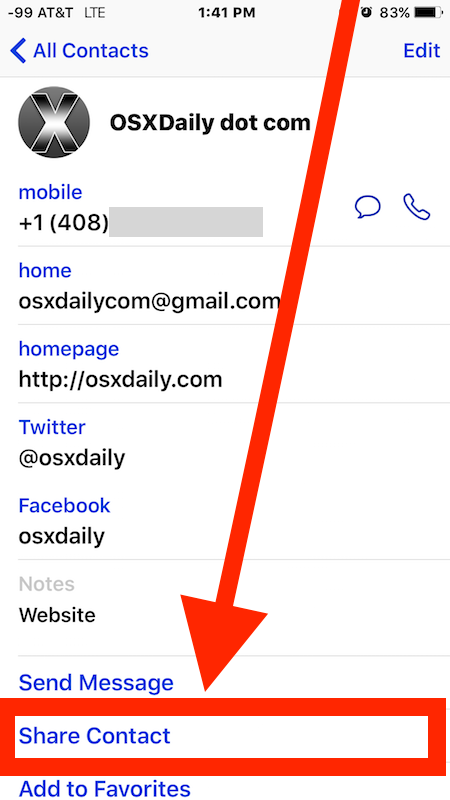 All you need to do is tap on the contact name vCard (.vcf) to see a preview of the information contained within (name, phone, address, etc), and then the iPhone/iOS user can choose to tap either “Create New Contact” to make a new address book entry for that individual, or select “Add to Existing Contact” to add the vcard data to an existing address book entry. Though these adding instructions are specifically for the iPhone, iPad, and iPod touch, you will find the importing process of VCF data is practically the same on an Android or Windows device as well. That’s because the VCF contact card format is universally supported, and each platform uses it for contact sharing. True – sending a contact to another iPhone is easy. But nothing beats the “Star Trekkiness” of zapping a contact across using those old infrared ports – think Palm. How about sending/receiving contacts and files via Bluetooth? I called your friend Colin Oates, he is a good friend. Everyone should have his phone number on their favorites list. What if I have 200 contacts?? this is not a “method” to send contacts. This is just the capability of iphone’s contacts app. Please be creative..
@KA I used a third party app called Copytrans Contacts to transfer the entire iPhone address book from my old to my new iPhone. It’s easy to use, but doesn’t run on Mac (tried it out). Thanks for sharing. You just made my day. Useless…..thanks for telling us how to save them…. How do you receive contacts on an iPhone 4 that was sent from an iphone5s using the share contact option? How do I send one photo to all of my contacts. Using iPhone 5. Thank you. As a tech support representative, I was baffled when a client told me that the contact information is being sent repetitively every few minutes for one contact and was sent four times for another. The recipient is extremely unhappy about the situation because they buy sms & email messages one-at-a-time. To whom do I direct the inquiry? The service provider? The phone manufacturer? The user having ‘mashed’ the wrong button? De-bugging these little black boxes is a serious problem…. Can I send more than one contact at a time by text? When you share a contact from your iPhone with another iPhone user it does not include any Notes on the Contact?!?!? Is there a way to share a contact and INCLUDE the Notes on the contact?? Is there a way just to send the phone number of a contact like Android allows? I don’t want to send my whole contact card with notes. Tried to send contact info to my brother’s phone but it only sent the phone number and email address not the rest of the contact card info….. how come?